Chronic fatigue syndrome (CFS) is a disease that causes a person to become so fatigued that normal daily function is impaired. The tiredness that is experienced is so severe that mental and physical activity or movement make this condition worse, and rest usually doesn’t diminish the fatigue. This disease is a difficult one to diagnose and treat because symptoms are sometimes very general, which may lead to confusion when trying to find a correct diagnosis. The major symptom used for diagnosis is chronic fatigue that has lasted longer than six months. Unfortunately, the causes of CFS aren’t well understood. The immune system may not be functioning well, or viruses may play a part. So how is this disease treated when there are so many unknowns? So far, there is no known cure for CFS, and the medications used are generally for treating symptoms such as sleep problems, and muscle aches. If you’re experiencing depression or anxiety, you may be prescribed an anti-depressant or anti-anxiety medication as well. Even though there is no cure, most symptoms improve with time. In the meantime, there are some effective self-treatments you can use. You can help yourself by keeping track of times of the day when you have the most energy and planning for activity during those times. Try to keep some activity and exercise in your life, even if it isn’t as much as you would like. You can also find a chronic fatigue syndrome support group in your area. And make sure you ask your friends and family for support while you’re finding ways to recover your lost energy. If memory and concentration are problems, become a note and list writer so you don’t forget important tasks and appointments. 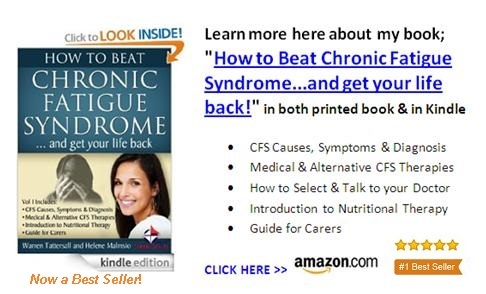 CFS is not well understood, hard to diagnose, and impossible to cure easily at this time. However, with the help of your doctor, you can find ways to deal with the symptoms while time takes its course in improving them. Be sure to find support in the form of family, friends and a support group, and give your body the time it needs to ease the symptoms. Did you like this blog post about CFS? You can also say hello, tel your own story, or share a tip by just clicking the COMMENTS link below - thanks!